Freedom Fighters: The Ray Blu-ray Combo Pack Review! Freedom Fighters: The Ray Blu-ray combo pack introduces fans of the Arrowverse to Ray Terrill and serves as enjoyable supplemental material for the live-action ‘Crisis on Earth-X’ crossover. Following in the footsteps of Vixen on CW Seed, Freedom Fighters: The Ray season one debuted on December 8, 2017. Featuring a gay titular hero (voiced by Russell Tovey), the series was able to attract a good amount of fans. The Ray also made his live-action appearance (played by Russell Tovey) during the live-action ‘Crisis on Earth-X’ crossover in November 2017. I am a fan of the animated versions of the Arrowverse shows because they’re fast-paced and the powers of the characters aren’t affected by live-action budgetary constraints. If you want to see just how powerful The Ray is, I recommend you watch his animated web series. The live-action version felt a bit weak to me when it came to what he could and couldn’t do while fighting alongside the rest of the heroes. 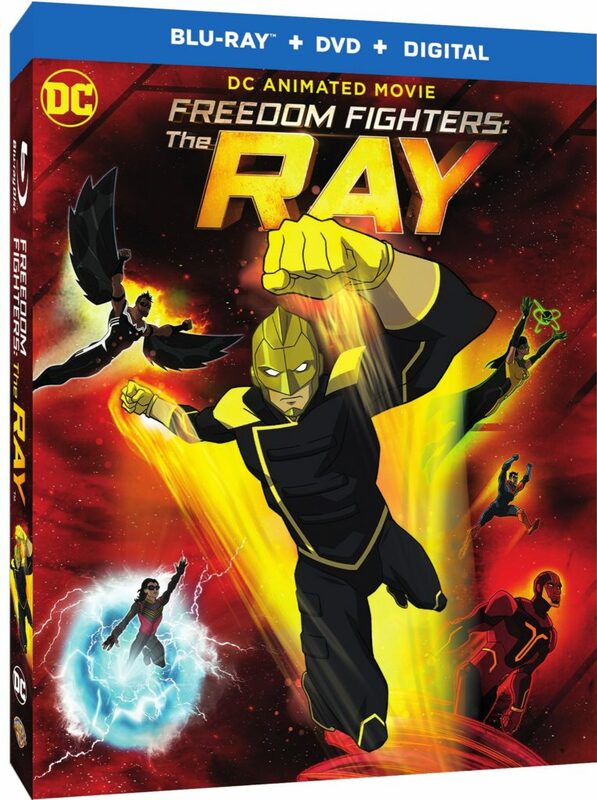 The Freedom Fighters: The Ray Blu-ray combo pack present the webisodes as a 72-minutes long animated movie. You will get to see how Ray got his powers (from an Earth-X version of himself), his training sessions as well as the trouble he faces when trying to tell his parents about his sexuality. Along with Russell Tovey as Ray Terrill, the voice cast also includes Jason Mitchell as Black Condor/John Trujillo, Dilshad Vadsaria as Phantom Lady/Jenny Knight, Melissa Benoist (Supergirl) as Overgirl, and Megalyn Echikunwoke as Vixen. There’s also Arrow actor Echo Kellum (Curtis Holt/Mr. Terrific) and The Flash actors Danielle Panabaker (Dr. Caitlin Snow) and Carlos Valdez (Cisco Ramon/Vibe), reprising their live-action series roles in animated form. Matthew Mercer voices Arrow while Scott Whyte voices the Flash/Blitzkrieg. Very observant fans might recognize some continuity issues. Even though Freedom Fighters: The Ray is supposed to take place before the ‘Crisis on Earth-X’ crossover (I think), the costuming of the rest of the characters is a bit weird. Anyway, the story itself is quite enjoyable with fast-paced action sequences and some emotional character moments dealing with Ray and his sexuality as the young man tries to come into his own as a superhero. Talking about the packaging, the Freedom Fighters: The Ray Blu-ray Combo Pack comes in your standard case expected from such home releases. The front has the main cover art while the back has the synopsis and a description of the extra content. The Blu-ray features 1080p High Definition 16×9 1.78:1 video presentation, allowing all of the animated scenes to look crisp and sharp. The sound remains clear through the DTS-HD MA: English 5.1 audio presentation. The DVD video presentation is 16×9 Widescreen (1.78:1). The sound quality is Dolby Audio English: 5.1 Surround. The difference in the Blu-ray and DVD’s video quality isn’t glaring. You can enjoy it on either disc, However, I do think Ray’s light looked a bit better in the Blu-ray presentation. Fans wanting a lot of extra content might be disappointed. Along with a few Arrowverse trailers, you get an approximately 2-minute long interview with Russell Tovey. I would have loved a longer feature talking about the animation process. But then again, with a $19.98 SRP for the combo pack, you do get a Blu-ray disc, a DVD, and a Digital copy. So, it does make up for the price even if this release feels lacking in the extra feature department. At least, the upcoming home release of fellow animated series Constantine: City of Demons looks ready to deliver an exciting bit of additional content. 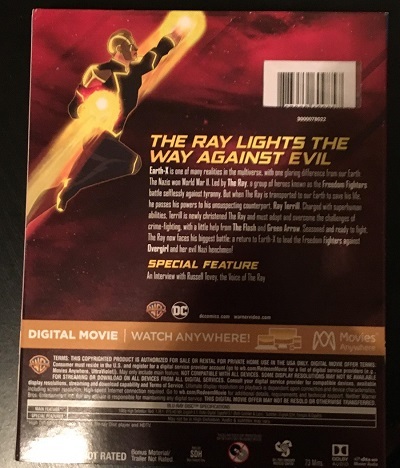 To be released on August 28, 2018, Freedom Fighters: The Ray will be available as a Blu-ray Combo Pack ($19.98 SRP) and on DVD ($18.94 SRP). It is currently available to own on Digital. Are you a fan of Ray Terrill? Let us know. Next: Go Go Power Rangers Is Giving Us Another Male Pink Power Ranger!